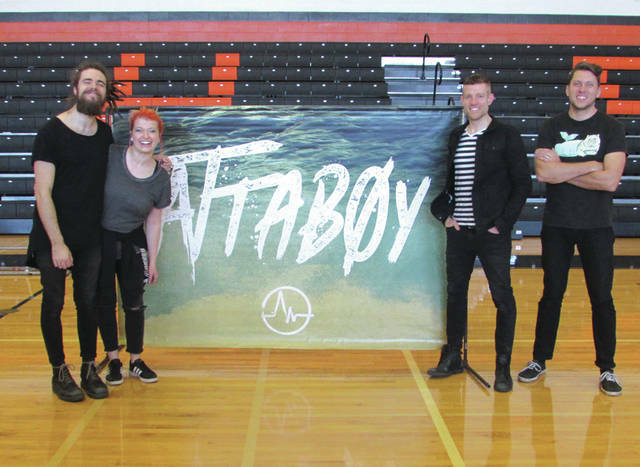 Fort Wayne, Indiana-based indie pop band Attaboy played afternoon and evening shows in the Arcanum-Butler Schools gymnasium Tuesday. 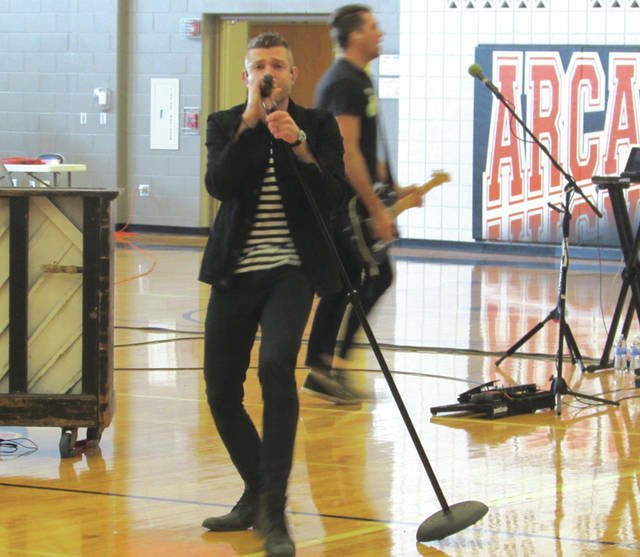 ARCANUM — Fort Wayne, Indiana-based indie pop band Attaboy played afternoon and evening shows in the Arcanum-Butler Schools gymnasium Tuesday. 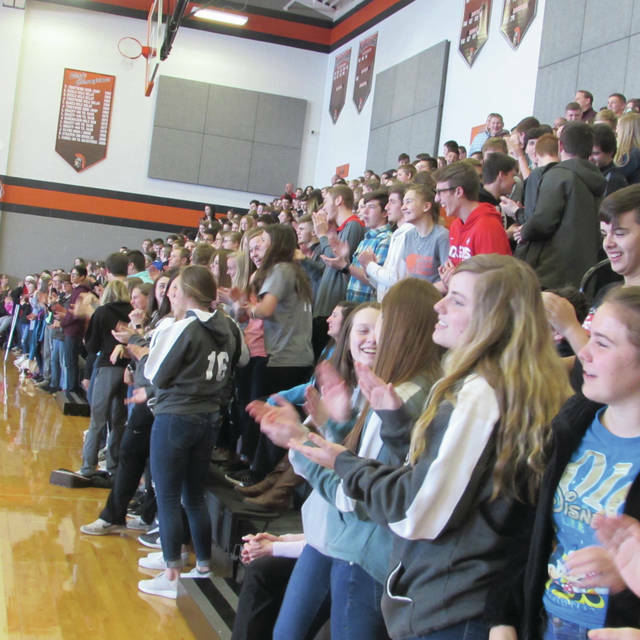 The group’s afternoon show was geared toward not only entertaining students but teaching them to resist peer pressure and make healthy decisions. 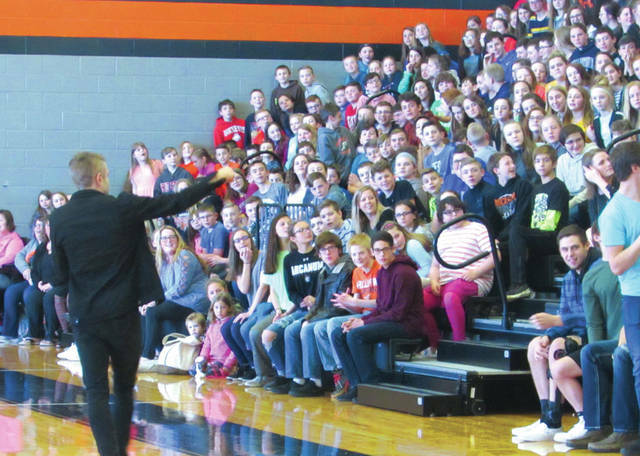 “Too often we forget that we have the chance to make decisions that are good, regardless of what anyone else says or does,” lead singer Ryan Payne told the assembled students. Payne told the story of how he had chosen to abstain from drinking alcohol while working for Royal Caribbean Cruise Lines but encountered resistance to his choice from coworkers and friends. Payne also stressed the importance of looking beyond the surface when making judgments about people, sharing the story of how he once witnessed a female friend being berated because of her physical appearance. Payne said this sort of prejudice is something we are all sometimes guilty of. “How many times do we get caught up in assuming things about people based on what we see? We can choose to be better than that,” Payne said. Attaboy was started by a group of Huntington University students in 2004, according to Payne. 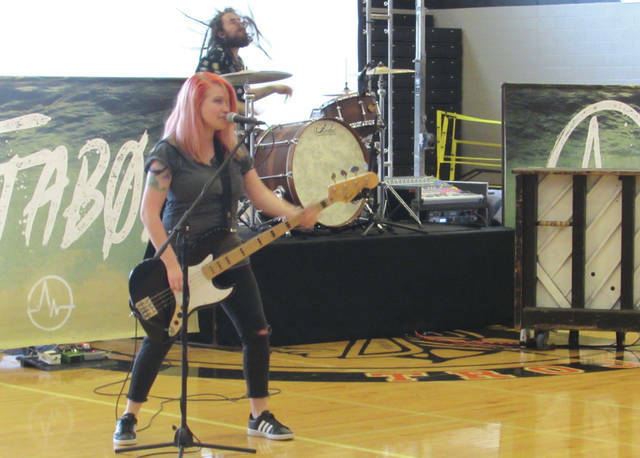 Though members have come and gone over the years, the current line-up consists of bass player and back-up vocalist Melanie Morris, drummer Christian Morris (Melanie’s husband) and guitar and keyboard player Jeff Edgel, all of whom currently live in or near Fort Wayne. Payne joined the group as lead vocalist in 2014. The band has performed in 36 U.S. states, as well in Canada and Denmark, Payne said, and has released five albums, with a sixth expected to drop at the end of the summer. The group does about 75 school-based shows a year, according to Payne. 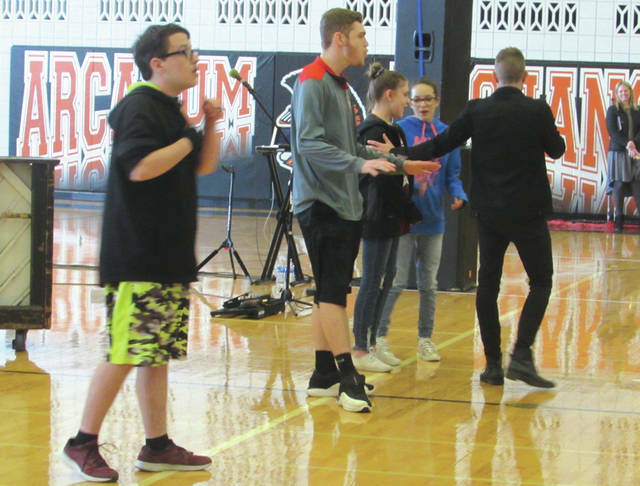 The band’s performance was paid for by a grant from Coalition for a Healthy Darke County and organized by Darke County We Are the Majority advisers Ashley Matheson and Kelly Harrison. Matheson is a K-8 school counselor at Arcanum-Butler while Harrison is a prevention specialist employed by Recovery and Wellness Centers of Midwest Ohio. Those interested in learning more about We Are the Majority, or about resources for battling drug addiction in Darke County, may contact Recovery and Wellness Centers of Midwest Ohio at 937-423-3423. Information about Attaboy can be found at attaboyonline.com. This entry was tagged Arcanum, Arcanum-Butler Local School District, Arcanum-Butler Schools, Attaboy, Band, Coalition for a Healthy Darke County, concert, Darke County We Are the Majority, Fort Wayne, Indiana, Peer pressure, Recovery and Wellness Centers of Midwest Ohio, We Are the Majority. Bookmark the permalink.